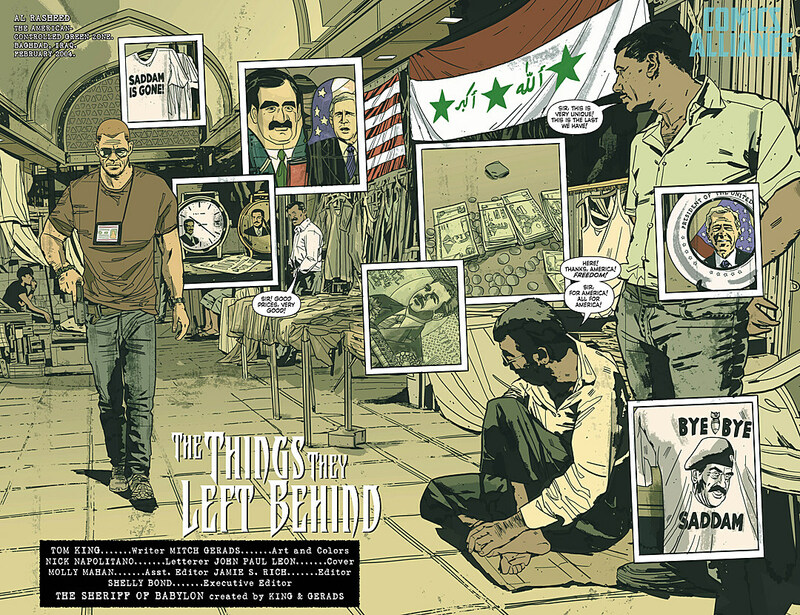 The first issue of Tom King and Mitch Gerads' Sheriff of Babylon was notable for a whole lot of reasons. For one thing, it was the first Vertigo comic that had to be run by the CIA before publication thanks to the influence of King's time working as a consultant during the Iraq War, but for another, it was quite simply an incredible first issue. Three separate stories, each punctuated by gunshots, setting the stage for a murder mystery set during the reconstruction of Iraq. Now, the second issue is bringing those threads together, as Christopher and Nassir meet to discuss their investigation in what has to be the most tense lunch since... well, probably since we all saw our relatives over the holidays. Check out an exclusive preview below! Rest assured that the printed version will have the cusses intact. Chris Henry is an American contractor in Iraq with a dead body on his hands and no idea what to do with it. That’s why he needs Nassir, one of the country’s last remaining old-school lawmen, to return the slain man to his family. Yet, with Sadaam Hussein long gone and Nassir’s badge long since retired, just what is motivating the man to help out?